Did the next-generation Nissan Almera from a few days ago wow you? 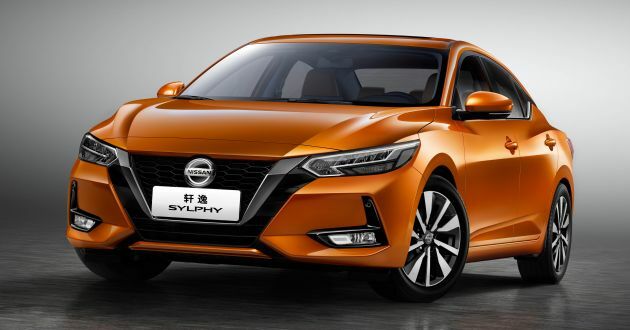 Well, it appears Nissan isn’t planning to slow down with its shock and awe approach, as it has presented the all-new, fourth-generation Sylphy at this year’s Auto Shanghai. Intrigued? Visually, the new Sylphy sports a more aggressive front end bearing the brand’s signature V-motion grille. This is joined by angular headlamps with a distinctive “boomerang” lighting signature within them, as well as concaved sections in the lower apron that accommodate the L-shaped trim surrounding the fog lamps. Strong creases on the bonnet leading from the grille to the A-pillars project a sense of strength, and the overall stance of the car is wider as well. Along the sides, the result of the sculpted bonnet is made more obvious, as are the prominent shoulder lines across the wheel arches. A carryover from the outgoing Sylphy is the kinked beltline close to the C-pillar, although this has been further worked on to incorporate a blacked-out area for a “floating roof” look. This trend was first presented on the IMQ Concept, and is present among recent Nissan models like the Almera, Altima, Leaf, March and Maxima. At the rear, the sleek, wraparound taillights feature the same “boomerang” look reminiscent of the headlamps. Meanwhile the boot lid blends in neatly with the rest of the bodywork, with the black C-pillars providing further visual drama. Down in the lower apron, a faux diffuser contributes to the sporty look that Nissan is going for. Nissan says this new shape also allows for a lower centre of gravity than before, as well as decreased wind resistance, with a drag coefficient of just 0.26. Barring any official dimensions, there’s also claims of a roomy and luxurious interior. On the inside, a completely new dashboard greets passengers, and is dominated by an 8-inch central display placed just above the triple air-con vents and climate control switchgear. If you’ll notice, the “Gliding Wing” that Nissan talks about is evident here, and incorporates slim air vents at the edges. A flatter centre console is where the gear lever, USB/AUX inputs, cupholders and engine start button are located, but strangely, the car seen in these photos still comes with a foot-operated handbrake although this could be specific to certain markets like China – there looks to be a place for an electronic handbrake. 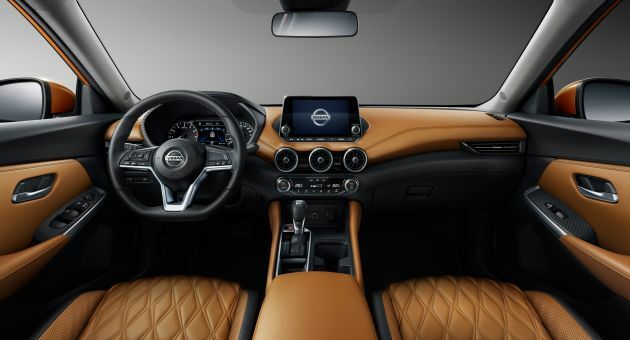 For the driver, there’s a new steering wheel design similar to those on other Nissans, and the instrument cluster sports both analogue dials and a middle seven-inch screen. Soft 3D Multilayer ergonomic seats are available with black, light gray or tan upholstery, with the last option benefiting from a diamond-cut quilting pattern as you see here. Safety technologies that are available include Intelligent Forward Collision Warning, Blind Spot Warning, Lane Departure Warning, Cross Traffic Alert and Intelligent Driving Alert, which support the driver in anticipating and avoiding hazardous situations. Engine-wise, the Sylphy gets a HR16DE Gen3 1.6 litre naturally-aspirated four-cylinder petrol engine, which is paired with an Xtronic CVT. Specific output figures have yet to be revealed, but Nissan promises a boost to engine stability and fuel efficiency. Further possible engine options have yet to be revealed for now. The car also comes with something called Integrated Dynamic Control Module that uses targeted brake applications after the vehicle encounters a bump or undulation to immediately improve the level of the body, enhancing ride quality. Other drive-related technologies include Intelligent Trace Control, Intelligent Ride Control and Emergency Brake for Pedal Misapplication. Outside looked like a Korean, inside looked like a Mercedes. Nissan is suffering from identity crisis. Their cars are just not original nor appealing. Civic ketam still has the best looks in and out. Doesn’t matter how it looks like. It will take TC 5 years to release it here. Wait lah. By then even slowpoke Toyota would have realeased their next gen Altis…and honda will have a new ketam long before that. This Nissan Sylphy deserved a INFINITI badge. I like the new Teana. It uses a VCT Turbo engine and with just a 2.0, it can produce about 250 bhp. TC will release it very much despec-ed and overprice. With one wheel and half an airbag. as long as it looks good, better than civic, worse quality than proton, steering rack problem, fuel pump problem, rattling everywhere, side mirror problem. Worst part is, they will find all the excuses to void your warranty, you aren’t even allow to put a sticker on your car. And you think I am here to sabotage Honda? No, I am 2017 Civic owner. I don’t get what’s with the race for Like/Dislike. Mods should look into this, particularly the Dislikes. Too many bored Nissan salesmen here me thinks. Finally Nissan design a car with good looking and handsome rather than the conventional or uncle style in the past. First impression of this new sylphy the front part look similar like Audi. The interior design look way better than the current Nissan though it is similar to other brands. But in automotive world it is common to copy other competitors and make some modification. Just like how the Kia and Hyundai did where I like and own one. I hope Nissan will upgrade their powertrain rather than using NA solely. Can you explain which Korean car this new sylphy look like? I drove a Korean car but I didnt find this car look similar to any Korean car. Yes the interior is somehow feel copy from Merc but isn’t this consider good thing? Many car manufacturers are making their own identity but not all look good. Look at the new A class, the new design actually get worst where the headlamp look weird. It is subjective to individual taste but certainly look awful for me. Inside and out , it is stunning …..
Its a shame tho that it didn’t get a new steering wheel to suit the new style…..
New A class is bigger and classier than Japanese C-segmenters. It is Japanese cars that has no class. I beg your pardon – ?? You forgot to factor in the TOTAL COST of purchase which I think the Sylphy should round up to RM100k to RM120k at the max lah! The first Sylphy in Malaysia had a 2.0L NA engine but a record breaking rear drum brakes for a C segment sedan. Second generation Sylphy had a 1.8L NA engine , at least it is done correctly with 4 disc brakes. Now third generation wanna shrink the engine down to 1.6L ? What are they thinking ? You need to rev the nuts out of the engine to get the car moving for such puny power to weight ratio. If you are talking about putting the 1.6L Turbo engine from the Nissan Pulsar with 6 speed auto, then it might sell well here. 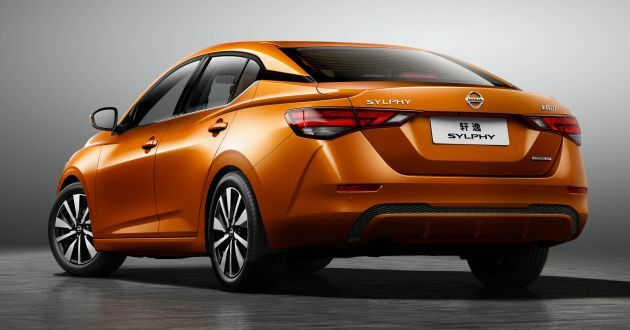 Nissan has to have a rebranding exercise, with the name Sylphy or anything close to syphilis it denotes a ‘disease’ rather than a car, hate to be cruel but someone has to tell it as it is. They used to make and still make good cars Infiniti and others, this model has a name issue, that needs to change. Nissan is not associated with the term “RELIABLE” anymore once it has joined the Renault family. I never drove a nissan. Is the cvt trans good? No problem as long you replace it once or twice in the car’s lifetime. I hope the GB will not be problematic…. So what’s this sylphy gonna be if they lauch here? Teana?